Recently, we were inspired by an image that was doing the rounds on social media. It perfectly encapsulates the ‘project management triangle’, which is often used by businesses to highlight constraints and set realistic goals and expectations for particular projects. The above mantra applies to SEO services, too – and here’s why. When it comes to SEO, you really do get what you pay for. Companies that are claiming to generate unrealistic results in a short period of time at cheap prices will not be able to deliver on all fronts. There’s no way they’ll have the capacity to tailor your campaign to achieve optimum results for your business; they’ll be more focused on getting quick positions than adding long-term value to your site. 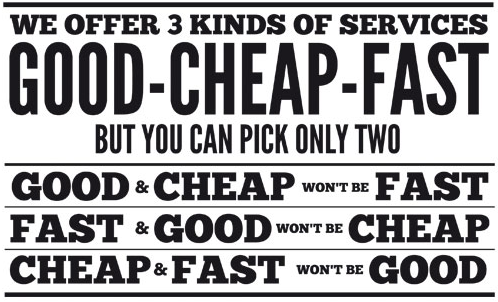 SEO is not cheap, nor is it particularly fast. In fact, it can take several months to see the effects of a campaign. But when it’s done right, it can have a seriously good impact on your bottom line. 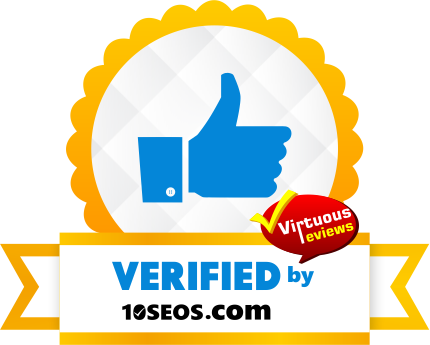 Often, companies that offer SEO services at discounted, ‘too-good-to-be-true’ rates are able to do so because they provide a standard, low quality package for all of their clients. They operate under a one size fits all philosophy and little thought goes into which approach is going to generate the best results. They convince you that you’re getting a fast, all-guns-blazing SEO service, and you’re happy that you’re getting it at a cheap rate – but the question is, will it really do your site any good? The best SEO providers will offer you a bespoke service to ensure your campaign suits your business goals and is tailored to the industry you’re in. They’ll spend time researching the right keywords; they’ll review the competition; they’ll work with you to find the best possible link sources and welcome your input at every stage. They’ll also build links gradually and consistently to ensure the process looks natural and holistic. This approach might be time-consuming, but ultimately it’ll help you achieve better search exposure for your website (and also give you a greater understanding of how SEO works so you can justify your investment). We know it’s tempting to go for the more cost-efficient SEO package, especially if you’re a start-up or a small business with limited resources. But in the long-run, choosing the cheapest option could be catastrophic. First of all, low-level SEO packages simply won’t achieve the results you’d originally hoped for, which will leave you unable to grow your business at the expected rate. You’ll be throwing money at a service that’s just not designed to work for you. Additionally, the low quality links that are inevitably used in these cheaper packages could also cause long-term damage to the reputation of your website, particularly if they’re generated from spammy-looking sources. A company that’s offering cheap solutions could be using black hat methods to build links fast, with little regard to the impact they’ll have on your website’s search performance further down the line (and as we all know, Google is getting much fussier about the quality of backlinks when it’s ranking sites in the organic listings). In the end, you need to be realistic about what you’re going to get for your money. If you want cheap and fast, you’ll think you’re on the path to success in the short-term, but are unlikely to benefit from the service in the months and years to come. If you want good, you’ll need to spend a little more with an SEO provider that will take the time to develop a strong, scalable campaign that’s going to meet the needs of your business. Our consultants have proven experience in developing great search exposure for start-ups and high-profile and clients alike. We’ll strike the right balance for your company, working with a realistic budget to achieve sustainable results. Find more information on our SEO services here.